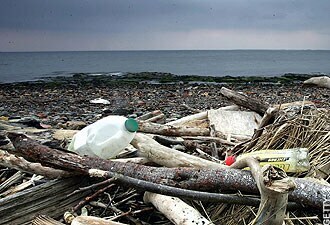 The 2008 annual survey recorded and removed some 385,659 items of rubbish including plastic bags, sanitary items, fishing nets, cigarette butts and cotton bud sticks from beaches across the UK. The average amount of rubbish found was 2,195 items per kilometre (0.6 miles) – more than two pieces for every metre (3.3ft) of beach, and more than double the 1,045 items per kilometre picked up during the first annual survey in 1994. More than a third of the rubbish was generated by the public followed by fishing litter, sewage-related rubbish and debris from shipping. The worse problem was plastic, which accounted for more than half of the litter found. It never breaks down and is a threat to wildlife. Emma Snowden, Litter Projects Co-ordinator for the MCS, said litter is not only ruining the appearance of Britain’s coastline but causing a hazard for threatened wildlife. She said more than 170 species including seabirds, turtles and whales have been known to mistake litter for food, which can lead to starvation, poisoning and fatal stomach blockages. More than 5,000 volunteers for the MCS surveyed 175.7 kilometres (109 miles) on 374 beaches for the survey, collecting 3,188 bags of rubbish last September. The dirtiest beaches were in the South West where 4,784 items of rubbish were picked up per kilometre (0.6 miles), although this is largely due to the patterns of tides washing rubbish into the area. Wales and Scotland were next followed by the South East where 1,941 items were recorded per km. The North West was slightly better followed by the North East and Channel Islands. Northern Ireland had the cleanest beaches with 940 items per km. Beach litter can also be hazardous to people and costs millions to clear up. However at the moment there is no Government-led plan of action to tackle the problem. Miss Snowden called on ministers to take action.